Aptus hit the ground running this New Year with three Safety Stand Downs held on back-to-back days in the North West, North East and Midlands, enabling the management team to engage with more than 300 employees and subcontractors. 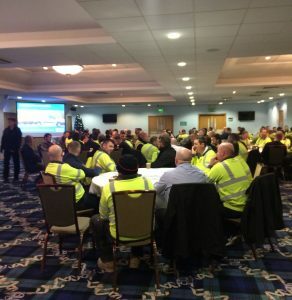 Stand Down meetings are held biannually and provide an opportunity to update administration and operations teams on company performance and new developments, as well as deliver a range of interactive training and upskilling sessions. Highlights from the January presentation include the company’s continued growth relating to workforce and geographical expansion and in terms of turnover and profit. Aptus is confident of meeting future growth targets with a healthy forward order book ensuring an upward trajectory for 2019 going into 2020. As the company goes from strength to strength Aptus is focused on recruitment across the business in order to meet the level of work scheduled. The company will launch its third Construction Apprenticeship recruitment drive in 2019. This follows two successful intakes in 2015 and 2017. Five Multi Utility and Jointing Operatives have qualified to date with another eight skilled operatives due to complete their apprenticeships this year. We will be announcing more on the third phase of our Construction Apprenticeship programme in the spring. Business apprentices continue to progress with Aptus and are taking up advanced trainee positions. As a result, we are looking to recruit three new business apprentices to support our head office administration team as we enter another exciting chapter in our development. For more information on jobs with Aptus please view our current vacancies.